Climate Common Sense: Bright spot for Labor! Aussies can no longer say that Labor couldn't organise a naughtie in a brothel! IT doesn't take a degree in rocket science to understand why Prime Minister Julia Gillard is keen to avoid any of the really hard questions about the past behaviour - and current honesty - of Craig Thomson, the Member for the New South Wales Central Coast seat of Dobell. Mr Thomson is not just some hack sitting on the back bench - he is chairman of the House of Representatives Economics Committee, one of the most important and prestigious non-executive positions. Mr Thomson is in the news for nothing to do with the national economy - he is the focus of national political debate because of some unfinished business from his pre-parliamentary job, as national secretary of the Health Services Union. While a union boss, Mr Thomson was responsible for credit card debts and cash advances running into the tens of thousands of dollars, including accounts for more than $2400 worth of services from a Sydney brothel. 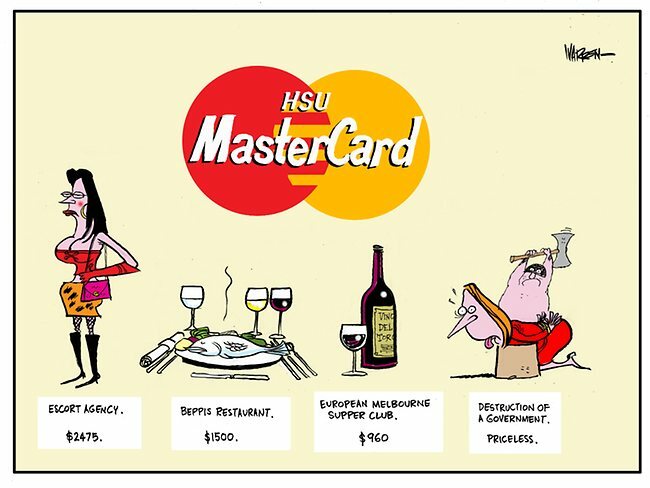 Other documents lodged with Sydney courts claim he used his official credit card to pay for lavish meals and up to $40,000 for election campaign expenses. Most of the allegations against Mr Thomson are in documents lodged as part of a now defunct defamation action the MP brought - the legal bills of which were paid for by the Labor Party in a secret deal only revealed when it was about to be published in our sister newspaper, The Daily Telegraph. Mr Thomson has admitted authorising the payment of the brothel bill but denies he used the services. He has rejected most other allegations though he continues to avoid any hard questioning. Opposition Leader Tony Abbott is calling for Mr Thomson to stand down or be sacked from his Economics Committee position and shadow attorney-general George Brandis is pushing NSW police to investigate the claimed credit card misuse. Without a full accounting of all these disparate and baffling allegations, these both seem to be reasonable courses of action. At the very least Mr Thomson should stand up in Parliament and acquit himself in relation to each and every claim made. If he won't do so willingly, Ms Gillard should demand it of him and threaten disendorsement if he doesn't comply. More broadly, the public will be questioning the relationship between the Labor Party and the union movement, how union officials seem to get preferential treatment as parliamentary candidates and the often insidious way funding for campaigns flows back and forth between the two bodies. Also under scrutiny is the way ALP candidates are selected and what rigour is applied when assessing their suitability. Ultimately, this is an affair about values, standards and ethics and the ability of the Labor Party to define them and abide by them. But Ms Gillard desperately hopes the Thomson affair will not reach a stage that threatens her gossamer-like hold on parliamentary power. A year ago Ms Gillard said she would govern as if she had a strong majority and not just one extra MP on the floor of the House. She should handle Mr Thomson in just that way, without political considerations. There are plenty of hard questions, Prime Minister. We await the answers. Craig Thomson has just announced he’s reisgning as chairman of Parilament’s economics committee. Julia Gillard should have demanded this last week, not been pressured into this today.